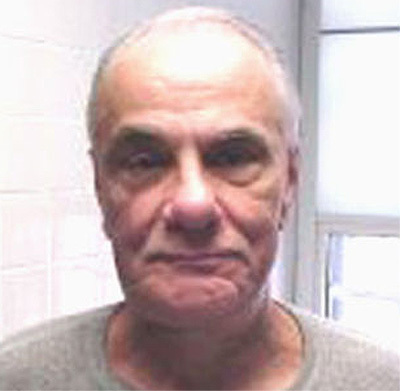 In the annals of crime John Gotti will go down as one of the most notorious mobsters in history, someone even mob fans who delight in Goodfellas and The Sopranos don't like. In the annals of cinema Gotti will go down as one of the most notoriously bad films in history, a film so desperate to be something it isn't that it becomes almost sad to watch and whose ending can be best described as wildly misguided. 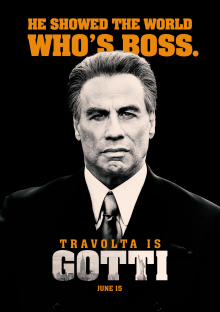 Gotti seems to have an overarching story of John Gotti Senior (John Travolta), dying of cancer, trying to persuade his soon-to-be incarcerated son John Gotti Junior (Spencer Lofranco) to not take a plea deal. Junior does not want to spend decades away from his wife and children, but Senior insists that if he gives an inch, they'll take a mile. I say 'seems to have an overarching story' because here we come to one of Gotti's many bizarre decision. The film is supposed to chronicle Gotti's rise from low-level hood to the head of the Gambino crime family and his successful efforts to thwart the federal government, earning him the nickname 'The Teflon Don'. However, director Kevin Connolly (best known as 'E' from Entourage) plays fast-and-loose with narrative structure to where you really have no idea where or when you are. Events happen in seemingly random order, or at least in an order that makes sense to Connolly's fanboy mob fantasies. Gotti is filled with stories, themes, plot points that have a roulette wheel-type feel, landing whenever and wherever the mood strikes them. It almost delights in being choppy and incoherent, and sometimes just beyond anachronistic. For example, there's a scene where Gotti is throwing a Fourth of July block party when the police show up. Not only does nothing really happen to Gotti (the police quickly back down and I think you can hear "We'll be back" or "We'll get you") but we meet the future Mrs. John Gotti Junior without getting to know anything about her. I'm almost sure her name was mentioned, but the only thing we learned is that she is 16 and can't accept Junior's offer of a beer, but a soda would be just fine. As if to add to the bonkers nature of this one scene, Armando Perez, better known as Pitbull, provides two of his hits (Don't Stop the Party and Fireball) to be played at this Fourth of July block party...even though Gotti himself died in 2002 and Don't Stop the Party was released a decade later (Fireball was released in 2014). Music plays a big part in Gotti as Connolly clearly thinks he's making his generation's Goodfellas. Like the Scorsese mobster film Gotti tries to use music to underscore the scene. Unlike Scorsese's mobster film Gotti selects either very curious music or anachronistic songs. I'm not sure why the attempted hit on Gotti via a car bomb had to have Pet Shop Boys' West End Girls. However, while I get the use of Duran Duran's Come Undone to show the fall of Senior, it comes across as laughable. We're introduced to characters via on-screen text but honestly apart from Sammy 'The Bull' Gravano they might have just been Connolly's friends and family up there for all the coherence we got. Moments that are meant to be serious and even heartbreaking, such as when Gotti is forced to 'shelve' a longtime friend to keep the peace, end up being hilarious. Even all that might be forgiven if not for cowriters Leo Rossi and Lem Dobbs' decision to essentially write a love letter to the Teflon Don, one that essentially suggests that Senior and Junior were victims of the government. The finale after Gotti Senior dies focuses (or focuses as much as the film is able to focus on anything) on Junior's struggles against the government, with closing text almost suggesting that it was a waste of time to have indicted Junior for anything. It's almost obscene in how Gotti essentially celebrates and whitewashes the mobster. There are only two performances of worth in this fiasco of a film. Stacey Keach's Neil, mentor to Senior, acts as if he is in a serious drama to where a story about him would have been interesting. Lofranco has some good moments as Junior, though he was hampered by the weird juxtaposition of actual footage of the real John Gotti Junior, where Lofranco looked both too young and too old to be the same person. Travolta tries with his broad Nuw Yawk accent but it comes across as more Saturday Night Live than The Godfather. His real-life wife Kelly Preston plays Gotti's wife Victoria in a performance that seems a spoof of The Sopranos. From its pro-mob angle to where you expect to see "A Cosa Nostra Production" on the screen to its incoherent manner, Gotti will be a textbook case of what not to do.